In Wan-Ke dream city’s ruined, barren land was a sound of rumbling. A snake as thick as a person’s waist charged like lightning towards the two scimitar-wielding Indians. The two Indians leaped with a ‘WHOOSH’ five or six meters high and grabbed the window railing of an apartment building. The snake’s tail then cruelly smashed into a tree on the side. From around five or six meters up the tree was a ‘KACHA’ sound as it directly split open and rumbled as it fell. “Haha, trying to kill me?” at this time, Luo Feng was sprinting quickly with a shield in one hand. The two heads of the twin headed black striped snake were crazily chasing after Luo Feng! He swung his arm and two throwing knives came out. It seemed like Luo Feng used his arm to throw them, but actually, the throwing knives were completely controlled by spiritual force right when they were thrown, causing the two throwing knives to accelerate to an amazing speed. An eye would barely be able to see two blurred, cold lights headed towards the twin headed black striped snake! “HISS~~” the twin headed black striped snake roared as it tried to dodge. “Change!” Luo Feng’s gaze was cold. The two throwing knives slightly changed direction, but not by a large amount. Since the throwing knives were way faster than bullets fired from a sniper rifle, the others couldn’t even tell that the throwing knives changed direction. One of the two throwing knives grazed the left head of the snake as it flew by, but the other throwing knife hit the left head. Ever since they started fighting, Luo Feng already let out six throwing knives, and all six of these throwing knives were attacking the snake’s left head. At this time, the snake’s left head was covered with fresh blood, and its wounds were shocking. “Hu!” Luo Feng’s body was extremely light, and his sprinting speed was startling. The bo staff-wielding leader of the Indian group made an excited shout and chased the snake, as if it was a running dog, while it was chasing after Luo Feng. One hit after another, he fiercely shot his staff towards the twin headed black striped snake’s right head. The twin headed black striped snake didn’t dare to use its head to block the alloyed staff, so it could only dodge. Once it makes contact, all of its power will be focused on the tip. The area of the tip isn’t large, so that small tip is like a blunt weapon! “Come on Indian, keep at it!” howled Gao Feng. The other two large scimitar and shield wielding Indian fighters, with Gao Feng, closely attacked the body of the twin headed black striped snake. First, doing this prevented the twin headed black striped snake from using its tail to attack Luo Feng and the Indian leader. Second, they also wanted to attack this giant snake at around 7 inches! TL note: Refer to the end for more information. Even though the snake was confident in its defense, it still didn’t want to let Gao Feng and the other two aim for its vitals. So the snake retracted its tail and wrapped it….. as it tried to think of a way to deal with Gao Feng and the other two. The shield in Luo Feng’s left hand was affected by spiritual force and, after Luo Feng exerted force in his foot, he intensely flew straight towards captain Gao Feng’s position. When he was near Gao Feng, Luo Feng whispered: “Captain, when you get near the snake to attack, use your hammer and smash right towards this snake’s left head!”. “Hehe, understood” Gao Feng immediately understood what Luo Feng meant. Luo Feng’s movements on the battlefield were strange and erratic. He never got close to the snake; he just relied on his amazing speed to hover around the battlefield. “YA!” The Indian leader suddenly shouted and his face reddened; the blood in his body was pumping to its limit. For a moment, his body looked like a legendary buddhist arhat. The bo staff in his body rapidly and ferociously increased in speed and, as if he was throwing away his life, he charged straight towards the twin headed black striped snake. The speed of the bo staff reached its limit and, in a blink of an eye, dozens of shadows were smashing towards the snake! Two of the dozens of shadows smashed directly into the snake’s right head. The right head of the gigantic snake couldn’t help but to shake, as if it was going to faint. With a rumble, the snake’s right head directly fell onto the ground. “HISS~” the left head of the twin headed black striped snake immediately let out a horrifying growl and its large, soft body suddenly moved. It actually shot up and speedily ran in a wavy motion. “Hurry!” the Indian leader, the bald brute, quickly roared. Gao Feng, who always stuck close to the twin headed black striped snake, roared: “Die!”. He used all of the power in his body to ferociously swing the heavy hammer in his hand. The heavy hammer was like an artillery shell as it cruelly smashed towards the left head of the twin headed black striped snake. The left head of the twin headed black striped snake immediately dodged away. Luo Feng, who wasn’t too far away, saw this and concentrated all of his spiritual force on the heavy hammer, instantly accelerating it by a huge margin! The twin headed black striped snake instantly dodged away. But even though the heavy hammer didn’t directly hit its head, it still hit the neck! With Gao Feng’s extreme power and Luo Feng’s spiritual force as support, the force of impact of this hammer was unrivaled. 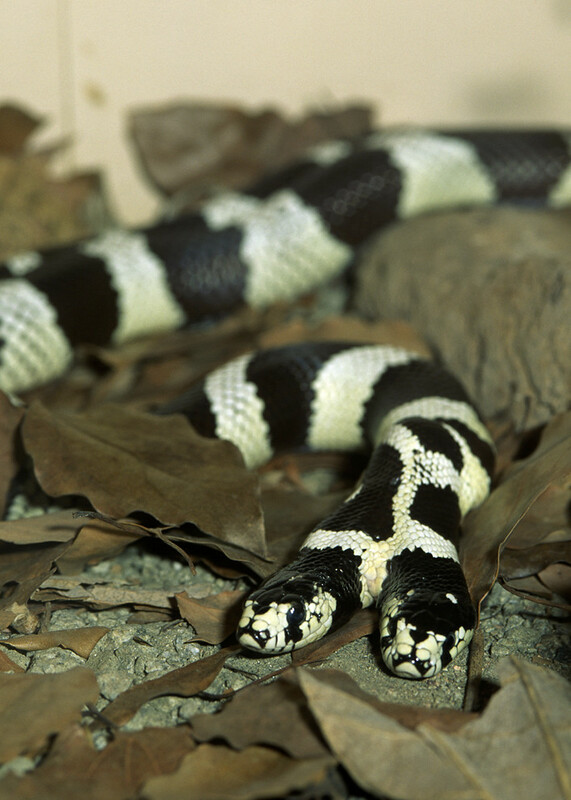 The left head of the twin headed black striped snake also couldn’t help but to fall to the ground with a dizzy motion. But right when it regained consciousness and was going to raise its head back up! Luo Feng let out a smile! “PUCHI!” a black knife instantly came out of the ground, went along the face of the left head of the snake, and directly shot into the head! The left head didn’t rise up again. “PU!” The alloyed bo staff of the bald brute Indian leader shot like lightning towards the eye of the right head, destroyed it, and then pierced the right head of the twin headed black striped snake! 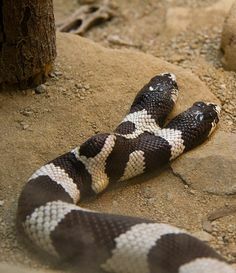 The twin headed black stripe snake already lost its life, but its gigantic body was still twisting around unconsciously. The movements slowed down and then it never moved again! “Haha!” The Indian leader couldn’t help but to laugh loudly. “Beautiful” Gao Feng was also happy as he went to pick up his hammer. Luo Feng was also smiling as he went to pick up his throwing knives. From beginning to end, the Indians probably never realized that their weapons were being controlled by spiritual force! Especially the last hit. Only until the head of the twin headed black striped snake fell on the ground did Luo Feng’s throwing knife come out of the ground to pierce its head. TL note: He said “good” in english. “You aren’t so bad either” laughed Luo Feng as he said. He could tell that the Indian staked his life on his final move. Even now, the bald brute’s face was completely flushed and his veins were still bursting. “You guys get half, we get half!” spoke the bald brute. Luo Feng pointed at the left head of the snake and slightly smiled: “The scales are half half too”. Both sides felt each other’s strength. Whether Luo Feng’s squad or the Indian squad, both probably have heated weapons aiming from a hidden area. That, and both parties are powerful. So both of them were in a good mood. Luo Feng and Gao Feng started dissecting the left head of the twin headed black striped snake! And the Indians dissected the right head. “Luo Feng, that blade was cruel” whispered Gao Feng. Luo Feng laughed as he took out the black throwing knife from the head of the snake after dissecting it. It was indeed that strike that killed the left head. Luo Feng and Gao Feng quickly turned over to look, and the faces of the three members of the Indian squad also changed as they looked. Nine human fighters from not too far away started walking towards them; most of them were yellow. When these nine people came and saw the gigantic snake in front of them, they instantly determined the price of it——a few billion dollars. With such a huge amount of wealth, quite a few people would show their inner greed. “Please go away!” the bald brute leader of the Indian group squeezed out some chinese. “Who would’ve thought that we’d meet the tiger fang squad here too. You sure linger around us” Gao Feng’s gaze scanned across the group in front of him. Luo Feng looked silently. Out of the nine people in front of them, other than the six members of the tiger fang squad, there was an old veteran, a huge white brute, and a mixed youth. “Haha, Gao Feng, you guys actually teamed up with Indians. Hmhm….. but for you guys to kill this twin headed black striped snake, how rare” the captain of the tiger fang squad laughed coldly, “If you’re wise, you’d hurry up and **** off. If so, our thunderbolt squad might spare your lives, or else….. hmhm, don’t blame us. Oh, senior Liu here is the captain of our thunderbolt squad. Mr. Ka Long here is our vice captain”. Senior Liu was that old veteran, and Ka Long was that white brute. “This is my first time here in #003 city, this prey is mine. You guys can leave” said the mixed youth as he smiled. The old veteran and the white brute stood on the two sides of the mixed youth as they scanned Luo Feng’s group. “Whoever dares to steal my prey….. dies!” said the bald brute leader of the Indian group. The two scimitar wielding Indians beside him were also displaying their killing intent. Do you think killing this twin headed black striped snake was easy? First of all, this valuable, mutated monster was already rare in the first place, and the battle was bitter too. Gao Feng also held his twin hammers with a fearsome gaze. “Our sniper rifle is also aimed at you!” said one of the scimitar wielding men of the Indian group coldly. Quite a few of the nine couldn’t help but to raise their heads to the surrounding residential apartments, but not even a shadow could be seen in these ruined buildings. But because they couldn’t see them, they became even more afraid. The tiger fang squad was clear: the fire hammer squad had Chen Gu as their sniper. And would the Indian group not bring their own professional snipers too? TL note (for the 7 inches part): Okay, for those interested/want more information, this is actually a saying: 打蛇打七寸 (if you want to attack a snake, attack at 7 inches). I heard there are variations like 3 inches too, but there are two meanings for this saying. First, don’t attack a snake if it isn’t at least 7 inches long. Next, 7 inches is the best spot to attack a snake. Refer to the photos below (although I’m not sure if these photos are exactly correct. I’m sure that it varies for different types of snakes).